Amazing mystery and spiritual novel that will change your view of human destiny and life. On her 25th birthday, on the night when the clocks are moved an hour behind, Angelica finds herself in the male body, almost a century before she was born. Her reality becomes intertwined with his as she discovers who he was. Through the mysterious dreams she observes his rise from poverty to power in pre-war Belgrade, while at the same time her life seems to spin out of control. 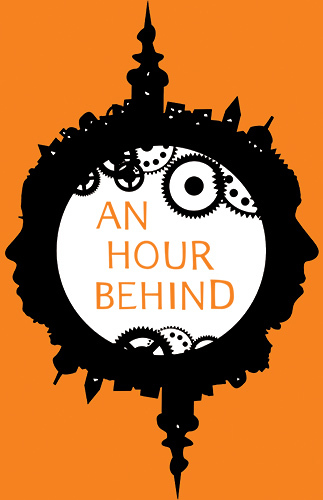 In her novel An hour behind, Dina Hrecak (Belgrade, 1984) shows us in a deeply symbolic way how to deal with familial problems that are left like an inheritance to those who know how to deal with them. The novel starts with an hour that marks the change from the daylight savings time, that brings new challenges to the days ahead, and the need for rectifying old mistakes to the nights. Angelica, the heroine of An hour behind, experiences the lives of her ancestors in her dreams from the view of her great-grandfather, Miodrag. The dead want the same as the living - absolution from their sins. The mixture of past and present seems unsolvable at first, many had failed before it. Angelica manages to do something no one had done before her - to take the best from both worlds and move forward with more certainty. Through the challenges before her, she overcomes the unsolvable and gains the most important knowledge - the sense of her own character, insight into the mistakes of her family members and the idea of what comes after death. A powerful tool. Even though An hour behind is her first novel, Dina Hrecak skillfully weaves the story line and patiently shapes her often juxtaposed characters, contributing in no small way to what we call Serbian Family novel. 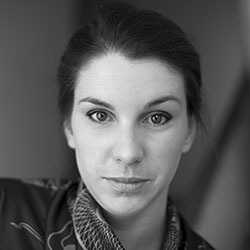 An ambitious and promising young novelist, born in Belgrade, Serbia in 1984. She graduated from Faculty of Philology in Belgrade University, department for Japanese language and literature, so she also works as a translator for Serbian publishing companies. Since early age she was interested in different languages and world cultures, and she is fluent in English and Serbian. Aspiring author’s first book “An Hour Behind”, an elaborate family saga with a dash of mystery and supernatural, was nominated and entered short selection for NIN Award, the most prestigious Serbian literary award. This is not surprising, since Dina started showing her creative talent very early by writing poems and short stories in genre of magical realism. As it is well-known that a mixture of genes from various nationalities often results in gifted and interesting personalities, Dina’s talent is not unfounded, because her ancestors come from all over Europe. The 20th century wars and migrations brought Dina’s grandparents together from Serbia, Ukraine, Hungary, Slovenia, Italy, Bosnia and Herzegovina, Croatia. Her ancestry alone can be an invitation for picking up her books, because each of them contains bits and pieces of her turbulent family history that she discovered through stories told by family members since she was a child. Inspiration for her works Dina finds in all those mystical and spiritual details whose nuances color and change human destinies. At first glance her common and simple events and characters, once written by her masterful pen, become mystical and tantalizing, never letting her readers catch their breath. Besides writing, Dina’s life is filled with beautiful, colorful events. She travels a lot, discovering far lands, cultures, people, destinies, smells and tastes, which inspires and broadens her writer’s horizons. Dina is also humanitarian and animal rights activist, she houses and nurses wounded wild birds and other animals and works closely with Serbian League for Ornithological Action. She paints on silk and dabs in photography. Currently, Dina is writing her second novel, expected in 2016.